Companion novels seem to be a thing lately. You have Marissa Meyer's Lunar Chronicles series and now your have Diana Peterfreund's For Darkness Shows the Stars series. If all companion series are going to be this good, I think we should do away with straight up sequels forever! Across a Star-Swept Sea is based on the novel The Scarlet Pimpernel This immediately puts me on a positive footing with this book. I love The Scarlet Pimpernel (Have you ever seen the musical? It's as good or better than the book). For Darkness Shows the Stars was based on Persuasion, a novel that I'd read but really couldn't remember. So that set up a barrier to the first story at the beginning (although I did end up loving it). By no means is it necessary to have read/watched The Scarlet Pimpernel before reading this book. It just adds an element of fun. At first, there seemed to be little connection between Across a Star-Swept Sea and For Darkness Shows the Stars aside from the basic mythological world and the annoying long titles ("irritating" at least to this blogger typing them out multiple times in a review). You have the concept of Reduced (vast swaths of the population born mentally disabled as a result of a human caused genetic manipulation), but it's almost been completely eradicated - very different from the first book. Except for this kingdom (think of Revolutionary France) who is forcibly administering medicine to its aristocrats to make them Reduced. Then you have another kingdom (call it England) that finds this abhorrent but is reluctant to do anything about it. Enter Persis Blake, one of the best strong female protagonists in years. She's brave - rescuing large numbers of Aristos from right under their captors' noses. She's selfless - she has a privilege life, she doesn't need to put herself at this risk. Yet she does and never asks for any credit (which she couldn't do anyway since it would ruin her cover, but still). She doesn't wear her emotions on her sleeve. When Persis falls for Justen, she doesn't let herself fall to pieces. She keeps up her act, remains strong - puts her cause above herself. She is all these strong things without coming off hardened or overly aggressive as a lot of character (i.e. Rose) tend to do. The book is also told from Justen's perspective. While he isn't as engaging a character as Persis, I still liked him and thought he was worthy of Persis's interest. He's a brilliant scientist. He's a commoner and looks down upon the Aristos, but also deplores the senseless destruction of their minds. He's also a haunted character - he's done something that wasn't wrong at the type but had horrible consequences that he never intended. The slight disorientation I felt because of the mythological differences between Books 1 and 2 went away quickly as I got caught up in the story. Plus, Kai and Elliot eventually show up and the differences are explained. The plot flows extremely well. There are so many different layers to Persis and Justen's lives. Persis particularly encounters physical dangers as well as family dynamics, the perils of politics, and the importance of social appearances. All this is presented in a way that makes each page feel relevant to the story. It's a relatively dense plot, but none of it feels superfluous. 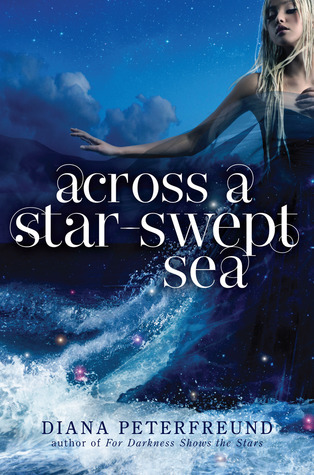 I really can't recommend Along a Star-Swept Sea highly enough. To say it's well-written is an understatement. The characters are lovable, the story is engaging, it ties in to the first book while also standing on its own...I could go on. You really must read this series. Diana is a master author. Awesome review! I loved the first book so I'm looking forward to reading this one. I've never seen the SP musical, but I would love to. I've just never had the opportunity. I have listened to the soundtrack with Douglass Sills though! I love the SP, too. Have you seen the Anthony Andrews The Scarlet Pimpernel movie? He's brilliant as Percy. Anyway, I am hesitant to read this one because futuristic societies make me really uncomfortable. but everyone says Peterfreund is an amazing author, and I've heard stellar things about this book, and Darkness, too. Do I have to read Darkness before this one, do you think? She seriously is a master writer -- the first in this world was an amazing story! I'm definitely looking forward to reading Persis and Justen's story. Wow...this sounds like an amazing series! Adding it to my list! I absolutely adored For Darkness Shows the Stars and I've been dying to read Across a Star-Swept Sea ever since I first heard about it. I'm so glad you enjoyed it and I'm really excited for it to come out in a couple weeks! Great review!